Clomiphene Citrate is typically prescribed for women to aid in ovulation. In men, the application of Klomen causes an elevation of follicle stimulating hormone and luteinizing hormone. As a result, natural testosterone production is also increased. This effect is obviously beneficial to the athlete, especially at the conclusion of a steroid cycle when endogenous testosterone levels are subnormal. When an athlete discontinues the use of steroids, his testosterone levels will most likely be suppressed. If endogenous testosterone levels are not brought to normal, a dramatic loss in size and strength may occur. Klomen plays a crucial role in preventing this crash in athletic performance. Bodybuilders find that a daily intake of 50-100 mg of clomiphene citrate over a two week period will bring endogenous testosterone production back to an acceptable level. 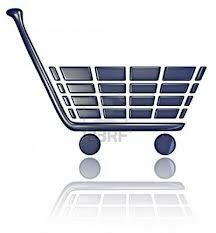 Klomen will gradually raise testosterone levels over its period of intake. Since an immediate boost in testosterone is often desirable, athlete will commonly use HCG (human choronic gonadotropin) for a couple of weeks, and the continue treatment with Klomen. 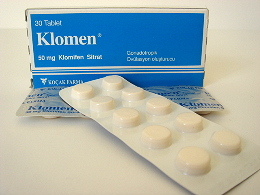 Klomen is also effective as an anti-estrogen. Most athletes will suffer from an elevated estrogen level at the conclusion of a cycle. A high estrogen level combined with a low testosterone level puts an athlete in serious risk of developing gynocomastia. With the intake of Klomen, the athlete gets the dual effect of blocking out some of the effects of estrogen, while also increasing endogenous testosterone production. Each 5000 iu box contains 1 ampoule of 5000 iu HCG ( + 1 solvent ampoule ). 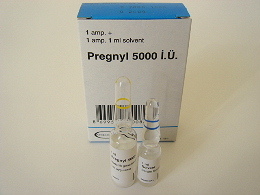 Pregnyl 3 X 5000 IU in amp & 3 X 1ml amp of water solution / HCG Each 5000 iu box contains 1 ampoule of 5000 iu HCG ( + 1 solvent ampoule ).